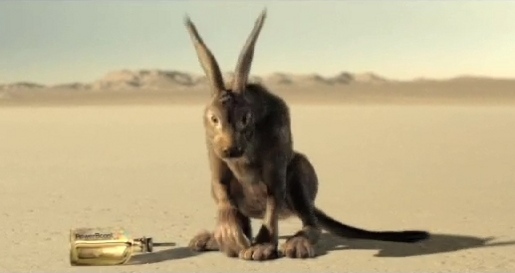 Internet provider Comcast takes speed metaphors to new heights with “Rabbit”, an award winning television commercial launched mid 2008 to promote Power Boost high speed connections. The spot has won awards at Cannes 2008 (Bronze), The One Show 2009 (Bronze), and the CLIOS 2009 (Silver for Effects Technique), and is one of the nominations at the D&Ad Awards being held tonight in London. A rabbit genetically modified and bred with a panther. A rabbit genetically modified and bred with a panther, with turbines attached. A rabbit slash panther with turbines, backed by an unusually strong tailwind…on ice. The rabbit panther thingy with turbines and tail wind on ice. Shaved, with a cold forged, high glide, surgical blade razor. The whole rabbit panther turbine tailwind hairless razor scenario driven by an over-caffeinated fighter pilot with a lead foot. All traveling down a ski jump in Switzerland, under better than ideal conditions. The Rabbit concept was developed at Goodby, Silverstein & Partners by creative director Jamie Barrett, group creative director Chris Ford, associate creative director/art director Nick Spahr, group creative director/copywriter Mike McKay, agency executive producer Tanya Le Sieur, assistant agency producer Peg Oberste. Filming was shot by director Noam Murro via Biscuit Filmworks with director of photography Jo Willems, senior executive producer Shawn Lacy, executive producer Colleen O’Donnell, producer Jay Veal. Editor was Avi Orin at Bikini Edit. VFX was produced at Animal Logic by creative director Bruce Carter, producer Nerissa Kavanagh, art directors Ben Walsh and Michael Halford, lead compositor Nicholas Ponzoni, CG lead Andrew Jackson and Andreas Wanda. Online editing was done at Brickyard VFX by 2D artist Patrick Poulatian, producer Diana Young. Colorist was Dave Hussey at Company 3. Sound was designed at Trinitite Studios by Brian Emrich, and mixed at One Union Recording by engineer Eben Carr. The voice over mix was produced by Rohan Young at Lime Studios. Graphics were produced by Superfad.